We are also told how all the rakes and shovels were ineffective. Nevertheless there was apparently a good deal of tillage farming in the area evidenced by the "vast abundance of exported potatoes and corn" and the "vast quantities" of oats, barley, flax and wheat which "were grown for sale" . It is important to remember that McParlan is, in the main, speaking of the better-off farmers and landed gentry, and is not cognisant of the plight of the poorer farmers and labourers. Ballinrobe has always been famous for the cattle and especially the sheep which were raised in the area around it. This is also true “ of the early 19th-century for the Neale, Ballinrobe and Hollymount all had fairs catering for both species of stock, though the "grand mart", as McParlan calls it, was at Ballinasloe. As early as 1741, and perhaps earlier, Ballinrobe's fair days were on the 18th of May and 24th of November; Kilmaine's were on the 1st of July and the 17th of October; Shrule's on the 30th of March, the 15th of July and the 31st of October; while a fair was held at The Neale on the 24th of July at; Hollymount on the 30th of November and at Loughmask on the 7th of September . In 1770 the area still had a preponderance of fairs, the dates and venues by then having been juggled about somewhat. Ballinrobe’s fairs were now scheduled for the 4th of June and the 5th of December, which were the day on which the fairs were held from then till the end of the period under review, the June fair being on Whit Tuesday t ill about 1830, after which it was held on Whit Monday. In 1770, Shrule had its fairs on the 16th of April, the 26th of July and the I2th of November, which dates it more or less retained in 1801. In 1770, the Neale had fair days on the 7th. of May, the 4th of August and the 5th of November, which it retained; in 1801 when it also had an extra fair day on the 5th of February. Hollymount had fair days on the 16th of May and the 11th of December in 1770 and in 1801. In 1770, Kilmaine had a fair day on the 11th of July and the 27th of October, and Loughmask had a fair on the 20th of Sept . While I have only checked the continuing tradition of fair days as far as Ballinrobe town is concerned, it is perhaps not imprudent to conclude that the same tradition of having fair days on the same days, for well over a century, persisted in the smaller places around it as well. It is interesting to recall that in 1801 best store bullocks at Ballinrobe fair sold at from 9 guineas to £18; year-old calves from £3 to £7; dry cows from £4 to £8; fat and milch cows from £10 to £15 and sheep from 30/- to £3,  which, while not sounding much by our standards, were in fact colossal sums by early 19th-century values, when as many as forty years later a man could only earn on average about eight pence per day, without food, for a harvest-day's toil. One of the few English travellers who has left us an account of his trip to Ballinrobe was the' English M.P John. C Curwen, who paid this countryside a compliment when he claimed in 1818 "the excellence of this pasture is proved by the admirable flavour of the mutton, which I do not think can be surpassed in any part of the world”. High praise indeed and no wonder, because he "fared sumptuously on the very best mutton" he ever tasted at the inn in Ballinrobe . The mode of feeding animals around Ballinrobe in 1801 was apparently with grass in summer and with hay and straw in winter. It is interesting to note that the poor, fed their cattle, horses, hogs and poultry with potatoes, "on which they thrived remarkably well". Farm-houses in the area in 1801 were in general neither "neat nor good", and the fences were "loose and bad" though they were of stone and, though fields in those days were by our standards huge, much of the country in the early 1800s' hadn't yet succumbed to the enclosure movement. In 1801 the houses of the people presented a variety of conditions; for while the upper ranks of the poor were "snugly lodged", the very poor had "very bad cabins, some made of sods and some of loose stones badly thatched, in which the cattle herd with the family......... . Thus at the outset of our period habitations were bad though as the half-century progressed they grew worse, and John Barrow in his infamous "Tour Round Ireland" in 1835, which was published the following year, has illustrated some miserable hovels as typifying the general County Mayo house of the time. Courtney Kenny, giving evidence to the Poor Enquiry Commissioners in 1836 held that as far as the parish of Ballinrobe was concerned the cabins of the poor were "built with dry walls of limestone generally", and plastered inside with mortar or clay and only some had chimneys. Their size varied from twelve or fourteen or sixteen feet wide.. .and from twenty to thirty feet long. Some had bedsteads though "the bedding is generally bad". Rev. Thomas J. Burgh giving evidence before the same Committee for Ballinrobe parish said these cabins were thatched straw over pet sods, and wattling; bed covering was insufficient and that many members of the same family "were often in one bed with little 'straw under and on the clay floor". Nevertheless in 1836 the rent of such cabins was very high, a cabin without land in Kenny’s estimation costing from 15/- to £1 per year and Reverend Burgh who put the cost as high as two pounds, said the average rent for a cabin with one rood was as much as four pounds. The tenants of Ballinrobe and of the greater part of Ireland in general, except the north, where the more secure "Ulster Custom" obtained, had no rights or claims to their patches of potato ground or to the miserable hovels which stood on them. They held their property without lease and many of them paid their rent in work at six pence per day. Reverend Burgh maintained that many of these cabins held more than one family, especially those which consisted of two rooms. Even the poor weavers, who settled in Ballinrobe, often lived with their families, their loom and their pig all in one room. Turf was the main fuel of this area in 1801, the cost varying in proportion to the distance the turf was carried, that is, from 30/- to £3 per ton. In 1818, it was from seeing numbers of the poorer people "bearing turf for the distance of two or three miles on their backs" that Curwen was struck by the "general poverty" of the inhabitants of this area. A local man, heavily laden with turf, told him that they had no want of fuel as they provided fuel for their homes when work wasn't to be had. The food of the poorer people around Ballinrobe at the outset of the 19th century consisted of "potatoes, oaten bread and their flummery gruel". In 1836 both Courtney Kenny and Rev. Burgh held that the ordinary diet consisted of "potatoes, eggs and salt-herrings". Burgh held that too often it was potatoes and salt only and that by then very few had even buttermilk. 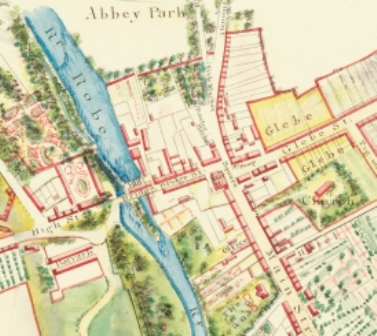 In 1836, Kenny and Burgh claimed that there was "no regular or constant employment" in the parish of Ballinrobe, the population of which was 8,933 according to the 1831 census, and that while out of employment, the people cultivated land under potatoes either in con-acre or in the tiny plot of ground adjoining their cabins. This page was added by Averil Staunton on 23/06/2013. Thanks for sharing that piece of history with us.